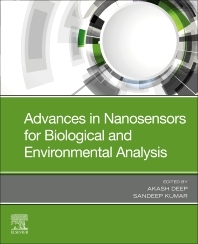 Advances in Nanosensors for Biological and Environmental Analysis presents the current state-of-art in nanosensors for biological and environmental analysis, also covering commercial aspects. Broadly, the book provides detailed information on the emergence of different types of nanomaterials as transduction platforms used in the development of nanosensors. These include carbon nanotubes, graphene, 2-D transition metal dichalcogenides, conducting polymers and metal organic frameworks. Additional topics include sections on the way nanosensors have inspired new product development in various types of biological and environmental applications that are currently available and on the horizon. Dr. Akash Deep is a Senior Scientist at CSIR- Central Scientific Instruments Organisation, Chandigarh. He received his Ph.D (Chemistry) in 2004 from the Indian Institute of Technology, Roorkee, India after which he worked as a postdoctoral research fellow in Portugal, England and Canada until 2008. He joined CSIR-CSIO, Chandigarh in 2008. Dr. Deep has worked in the fields of analytical and material chemistry, biochemistry, and nanosensors for environmental and health applications. He has expertise in the synthesis and applications of advanced materials, such as 2-dimensional layered materials, fluorescent nanoparticles, metal organic frameworks, graphene composites, and conducting polymers. Dr. Akash Deep has also worked as a Visiting Professor at the Hanyang University, Seoul, South Korea. He has published more than 110 research articles in reputed international journals (including Progress in Material Science, Progress in Polymer Science, Coordination Chemistry Reviews, and Biotechnology Advances) and 4 book chapters. Dr. Sandeep Kumar, Assistant Professor, is a researcher of international recognition at the Department of Bio and Nano Technology, Guru Jambheshwar University of Science and Technology, Hisar, Haryana, India. Dr. Sandeep Kumar has received his PhD degree from Panjab University, Chandigarh. His current research interest includes synthesis and characterization of nanomaterials, nano-carriers for healthcare applications; nanomaterials based sensors, biomaterials and nanotoxicity. Dr. Kumar has one patent and published more than 80 research papers in international journals of repute. Dr. Kumar has international and national sponsored research projects from numerous funding agencies. Dr. Kumar visited Hanyang University, Seoul, South Korea as a visiting Professor and also Australia, UK, Scotland, Thailand, United Arab Emirates under different schemes of Govt. of India.